U.S. delegation visits Simferopol, June 21, 2016. Center for Citizen Initiatives visit includes former U.S. public officials. 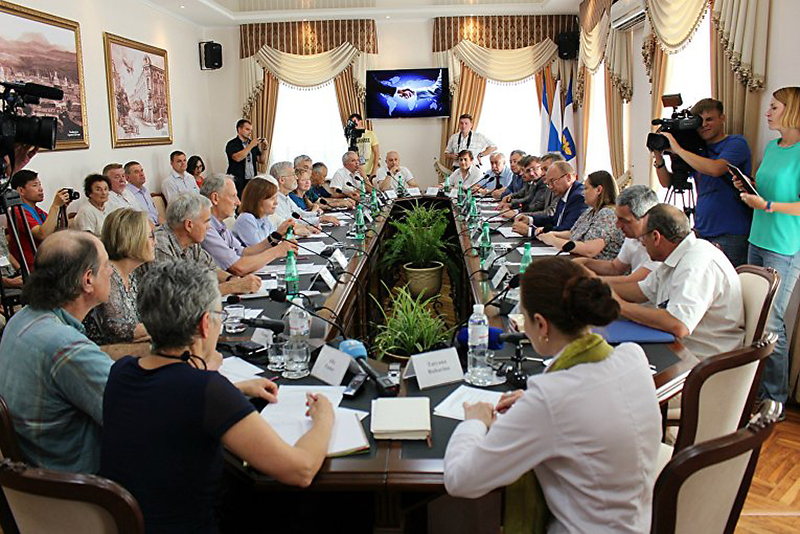 A U.S. delegation headed by Sharon Tennison, the president and founder of the Center for Citizen Initiatives (CCI), arrived in Crimea on an official visit on June 21. The delegation includes around ten American public figures, former officials and teachers. The first official event was a meeting with Simferopol City Council President, Victor Ageyev, and the head of the city administration, Gennady Bakharev. "First of all, please allow me to congratulate you on your courage," Bakharev said during the meeting. "We understand how important the work of Citizen Initiatives is in our conditions. I hope that after getting to know us you will see that Crimeans, regardless of their religions and nationalities, are all united and are building a new Crimea." The Crimean government was open to relations with foreign delegations, he added. Tennison thanked the Simferopol authorities for their warm reception. "I am very flattered by this encounter. I must admit this is the best delegation that I could have ever brought here. These are men and women who held very high positions in the American government," said Tennison, who founded CCI in the early1980s to help reduce tensions between the Soviet and U.S. super powers. "We are all here because we want to embody good relations between our countries. We will use all our voices and opportunities to report what is really happening here in Crimea, because we've been here in person." Delegation member Ann Wright, who is a retired colonel and former U.S. State Department official, called the sanctions against Crimea "unjust and inhumane." She said that she was preoccupied by these measures. "I've been in Iran, Iraq, Libya, Cuba, North Korea, that is, everywhere that the U.S. imposed sanctions. Sanctions policies never work, nevertheless the U.S. always tries to introduce these sanctions in order to force people to change their views. I am impressed by the Crimeans' courage, by their determination, despite the sanctions, to do what they feel is necessary and not what others expect of them," Wright said. Recently, several foreign delegations have visited the peninsula. In May a group of Italian parliamentarians came to Crimea, as well as an official delegation from Germany that included politicians and businessmen.